AutoSound Technical Magazine was established in 1998 by two car hi-fi enthusiasts, including its present editor-in-chief. 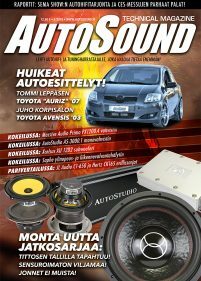 AutoSound is first, and so far, only car hi-fi magazine in Finland. It is a specialist magazine for car hifi and multimedia. AutoSound offers product reviews and tests, comparison tests, car and systems reviews, articles, reports and news about car hi-fi. Its readers are interested in car hi-fi and a typical reader is male, aged 18-25.